ART COMPLEX - MADHAVAN NAYAR FOUNDATION, EDAPPALLY - Located at Edappally, 10 kms north of Ernakulam en route to Alwaye, the complex consists of two units: the Gallery of Paintings and Sculptures which presents over 200 original paintings by contemporary Indian artists, some of them internationally acclaimed, and works of reputed Indian sculptors. The other unit, the Centre for Visual Arts is reserved for authentic reproductions of selected world masters from Leonardo da Vinci to those of the present century. The centre also exhibits certain larger-than-life mural reproductions of ancient Indian Art. Open 10 AM to 5 PM. Closed on Mondays and Public Holidays. Tel: 2558296. BOLGATTY ISLAND - This long narrow palm-fringed island, easily accessible from the mainland, is where the Bolgatty Palace is situated amidst 15 acres of lush green lawns. Built by the Dutch in 1744, it became the seat of the British Resident later. In 1976 the palace was converted into a hotel under the Kerala Tourism Development Corporation. The Cochin Golf Club's course is on the palace grounds. 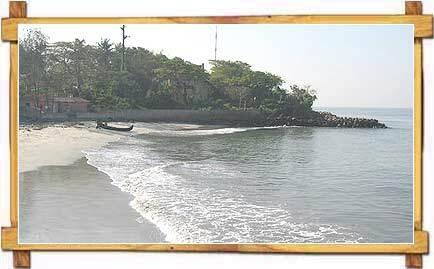 CHERAI BEACH - Located 25 kms from Ernakulam in a typical village ambience is this lovely unspoilt stretch of sand, ideal for swimming. But if the sea and sand still do not whet your appetite, there're any number of food outlets and ice-cream parlours to do so. At Cherai, life guards are always on the look out for the over adventurous. Dolphins are also commonly seen in the waters. 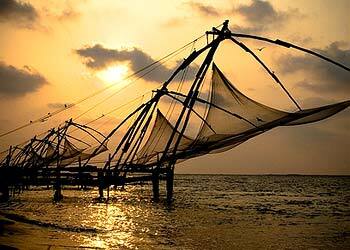 CHINESE FISHING NETS, FORT COCHIN - These fixed, cantilevered fishing nets, at the entrance of the harbour and along the backwaters, were introduced by traders from the court of Kublai Khan. Records show that they were first erected between AD 1350 and 1450. The best place to watch these nets is from Vasco da Gama square, a narrow promenade that lies parallel to the beach. DUTCH CEMETERY, FORT COCHIN - Consecrated in 1724, here's an authentic reminder of the many men and women from Europe who came down all the way to play out their roles in the colonial 17th, 18th, and 19th centuries. DUTCH PALACE, MATTANCHERRY - The Palace, originally built by the Portuguese and presented to the Cochin raja Veera Kerala Varma in 1555, acquired its present name after 1663 when the Dutch carried out some extensive repairs. The Cochin rajas held their coronation ceremoniesin the Central Hall of this double-storey quadrangular building. Rooms adjacent contain breathtaking 17th-century murals depicting scenes from the Puranas and the great epics - the Ramayana and the Mahabharata.Open 10 AM to 5 PM. Closed on Fridays. 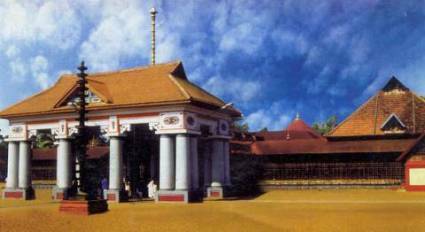 ERNAKULAM SIVA TEMPLE, ERNAKULAM - Facing the historical Rajendra maidan, on Park Avenue, is this famous temple, considered to be amongst the most ancient in central Kerala. Though no historical records exist to indicate a precise date, an inscription found above the main entrance in Vattezhuthu, an antiquated script, suggests that the sanctum sanctorum was built in the year 1614. The deity is popularly referred to as Ernakulathappan. The temple's 8-day annual festival is celebrated in the month of Makaram (Jan-Feb) with colourful rituals and exciting cultural events. The bathing of the idol, on the eighth day, is particularly significant here. The ceremony of Ashta Bandham Kalasam, where the deity is anointed in a herbal paste, is performed once in 12 years. FORT COCHIN BEACH - An ideal place for an evening stroll and to watch a spectacular sunset. Bathing and swimming are not recommended here. The colourful carnival at New Year's Eve is a feature of this beach. 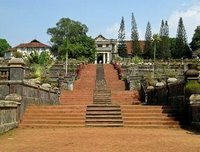 HILL PALACE MUSEUM, TRIPUNITHURA - Set on top of a hillock, this prodigious palace-turned-museum displays 13 categories of exhibits, including paintings, carvings and other royal antiquities donated by the Cochin and Travancore royal families and the Paliam Devaswom. The Heritage Museum, located on the rear side of the palace buildings, familiarizes you with the traditional lifestyles of ancient Kerala. As part of the establishment of a mini zoo, a deer park is run by the Society for the Preservation of Hill Palace Premises. The museum premises has also been converted into a botanical garden with exotic tropical trees from central America to Australia. 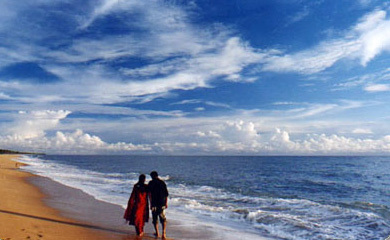 Located 11 kms east of Ernakulam, en route to Chottanikara. Open 9 AM to 5 PM. Closed on Mondays. Tel: 2781113. INDO-PORTUGUESE MUSEUM, FORT COCHIN - Located within the compound of the beautiful 1506 Bishop's House, the museum established in a seperate building showcases artefacts like statues and coins left back by the Portuguese. JEWISH SYNAGOGUE, MATTANCHERRY - Built in 1568, this is the oldest synagogue in the Commonwealth. The Great Scrolls of the Old Testament, copper plates on which the grants of privilege made by the Cochin rulers were recorded, gold and silver crowns gifted by various patrons to the synagogue, exquisite Chinese hand-painted willow patterned floor tiles, and the synagogue's elaborate lighting are of interest. Open 10 AM to 12 Noon and 3 PM to 5 PM. Closed on Saturdays and Jewish holidays. 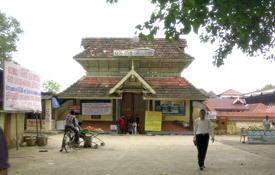 KALLI KOTA, TRIPUNITHURA - As the name suggests, this beautiful, imposing building - a legacy of the Dutch rule - served as an entertainment auditorium to the erstwhile royalty featuring dance, drama, and plays. Today it functions largely as a marriage hall. Situated near Poornathreyesa temple. KERALA LALITHA KALA AKADEMI ART CENTRE,ERNAKULAM - Located on DH Road, this hall, now opened up as an art centre, had been the durbar of the raja of Cochin. Open 10 AM to 5 PM. Tel: 2367748. 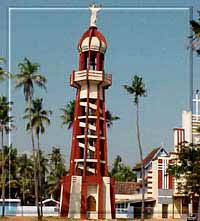 LIGHT HOUSE, VYPIN - The light house at Ochanthuruth in Vypin is open from 3 PM to 5 PM, on all days. MANGALAVANAM (MANGROVE FOREST), ERNAKULAM - This small protected area, a haven for birds, is located on Dr. Salim Ali Road, adjacent to the High Court of Kerala. Best time to visit : mid-January to early March. MOUNT CARMEL CHURCH, VARAPUZHA - This 1642 church is the second Indian vicariath established by Holy See after Goa. The Portugese church bells are of great interest. MUSEUM OF KERALA HISTORY, EDAPPALLY - Located along with the Art Complex at Edappally, it is a Sound and Light show presenting thirty five scenes from the political, social, and cultural history of Kerala. Commentaries in English and Malayalam. Open 10 AM to 4 PM. Closed on Mondays and Public Holidays. Tel: 2558296. PALLIPURAM FORT, VYPIN - It is situated at the far end of Vypin island. Small and hexagonal, it was built in 1503, claiming to be the oldest European fort in India. The structure's walls have around 20 cannon emplacements. Open on Thursdays. PARADE GROUND, FORT COCHIN - Covering more than four acres, this large open ground was used by the Portuguese, the Dutch, and the British for conducting military drills and parades during the colonial years. The defence establishments of these powers were housed in some of the elegant buildings surrounding the ground. Located adjacent to St Francis' church, the ground today serves largely as a recreation and sporting turf. SANTA CRUZ BASILICA, FORT COCHIN - Originally built by the Portuguese, this church was elevated to a Cathedral by Pope Paul IV in 1558. The church was totally demolished by the British who took over Cochin in 1795. 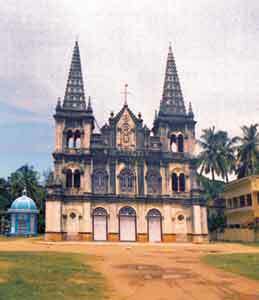 Later Bishop Dom Gomez Ferreira commissioned a new building in 1887. Santa Cruz was finally proclaimed a Basilica by Pope John Paul II in 1984. The basilica, situated close to the St. Francis Church, has some beautiful paintings. 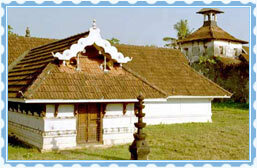 SREE POORNATHREYESA TEMPLE, TRIPUNITHURA - Formerly belonging to the Cochin royalty, this temple has Maha Vishnu as its presiding deity. Legend has it that Arjuna, the great archer and warrior, had established this sanctum. The annual temple festival is held in Nov-Dec, while the colourful Athachamayam, a cultural extravaganza, is celebrated every year during the festival of Onam. SREE RAJARAJESWARI TEMPLE, CHOTTANIKARA - Located 15 kms from Ernakulam, this 10th century temple, one of the most renowned in Kerala, is an important pilgrim centre. The goddess here is worshipped in her three forms, one after another, as the day progresses - as Saraswathy in the morning, as Bhadrakali at noon, and as Durga in the evening. The temple's annual festival is held in Feb-Mar for nine days with 'Makam Thozal' considered the most important day. The Navaratri celebrations are also worth seeing. ST. FRANCIS CHURCH, FORT COCHIN - Originally built by Portuguese Franciscan friars in 1503, it is believed to be the oldest existing European church in India. The original structure was made of wood, but was rebuilt in stone around the mid-16th century. The church was Roman Catholic during the Portuguese period from 1503 to 1663, Dutch Reform from 1664 to 1804, and Anglican from 1804 to 1947. Today it is governed by the Church of South India. After his death, Vasco da Gama was buried here in 1524 before his remains were transferred to Lisbon, 14 years later. Of interest are the rope-operated punkahs, or manual fans. ST. GEORGE FORANE CHURCH, EDAPPALLY - An important pilgrim centre, this Roman Catholic church was built way back in AD 593 in a plot of land donated by the Raja of Edappally. 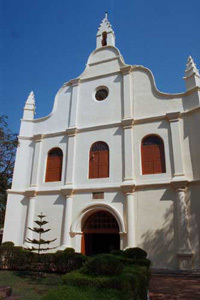 After the seven churches were founded by St. Thomas, the Edappally church is considered to be one of the oldest in Kerala. The new church beside it was built in 1080. Historical records have it that a session of the Synod of Diamper (Udayamperoor), 1599, was held here. The church is also well known for its annually held nine-day feast in April/May. SUBHASH BOSE PARK, ERNAKULAM - This sprawling park is an ideal place for an evening stroll, a family outing, or to take your children out for some fun and frolic. The park adjoins the Vembanad lake offering fantastic views of the Cochin harbour. A small aquarium is an added attraction. Entry free. VAMANAMOORTHY TEMPLE, THRIKKAKARA - Set in a land of great mythological significance, this ancient temple, dedicated to Vamana - the fifth avatara of Lord Vishnu - is venerated by the Vaishnavaites as one among the 108 holy places in India. The temple holds a large number of lithic records, some of great historical significance. The annual festival is held in the month of Chingam (Aug-Sept). VOC GATE, FORT COCHIN - Facing parade ground is this large wooden gate with the initials 'VOC' carved onto it representing the monogram of the once mighty Dutch East India Company. The inscription also indicates that it was built in the year 1740. Government of India Tourist Office , Willingdon Island, Cochin 682003. Tel: 2668352. Working Hours 9 AM to 5 PM. KTDC Tourist Reception Centres, Shanmugham Road, Cochin 682011. Tel: 2353234. Working Hours 8 AM to 7 PM, Ernakulam Junction Railway Station, Cochin 682016. Working Hours: 9.30 AM to 5.30 PM. Tourist Information Office, Old Collectorate, Cochin 682011. Tel: 2381743. Working Hours 10 AM to 5 PM. BACKWATER VILLAGE TOUR (KTDC): Daily. Fare Rs 350/- per head. Ride through narrow canals, fishing farms, exotic scenery and general life. Timings: 8.30 AM, 2 PM. Reporting at KTDC Office. BACKWATER VILLAGE TOUR (KTDC): Full Day, Daily. Fare Rs 650/- per head, inclusive of vegetarian lunch and evening tea. (1st session): Ride through the placid backwaters in a covered boat. (2nd session): Ride through narrow canals and exotic scenery. Timing: 8.30 AM to 6.30 PM. Reporting at KTDC Office. COCHIN SUNSET TOUR (KTDC): Daily. Fare Rs 40/- per head. Timing: 5.30 PM to 7 PM. Boarding: Sealord Jetty. COCHIN BOAT TOUR (KTDC): Fare Rs 100/- per head covering Dutch Palace & Jewish Synagogue, Mattancherry; Chinese Fishing Nets & St. Francis' Church, Fort Cochin; Bolgatty Palace, Bolgatty Island. The boat cruise starts and ends at Sealord jetty, behind GCDA Commercial Complex, Marine Drive, Ernakulam. Timings: 9 AM to 12.30 PM, 2 PM to 5.30 PM. Further information is available from the KTDC Tourist Reception Centre, Shanmugham Road, Cochin 682011. Tel: 2353234. (Office hours: 8 AM to 7 PM). Package tours for Indian tourists in the 2007 season includes a 6-day journey by ship from and to Cochin with a 2-day (on board ship)and a 3-night stay in any one particular island - Kadmat or Taratashi. A 5-day Coral Reef cruise from and to Cochin includes day excursions to the three islands of Kavaratti (Taratashi), Kalpeni (Coconut Grove), and Minicoy (Swaying Palm). Night stay is on board the ship. Kadmat, with some of the world's premier dive spots, has a full-fledged water sports institute. For details on these exotic trips, contact K Cheriyakoya, Asst. Gen. Manager, or Shihabuddin M C, Manager - Information & Booking, Sports, Lakshadweep Tourism, Indira Gandhi Road, Willingdon Island, Cochin 682003, Tel: 2668387, Fax: 2668647. The Tourism Police wing is specially trained to deal with visitor queries providing detailed information on hotels, lodges, distance between places, boat and taxi services, bus routes, etc. They operate at Fort Cochin, Mattancherry, Ernakulam Junction Railway Station, KSRTC Bus Stand, Chamber Corner, and the two boat jetties.